OYAM – Residents of Kamdini Sub-county in Oyam District are living in fear following the destruction caused by stray elephants. The Kamdini Sub-county leadership said the strayed elephants destroyed several acres of crops in the five parishes of Kamdini, Pukica, Zambia, Nora, Juma and Ocini. Mr Peter Odongo, a resident of Apala B village in Zambia parish, said the elephants destroyed six acres of his groundnut and maize gardens. 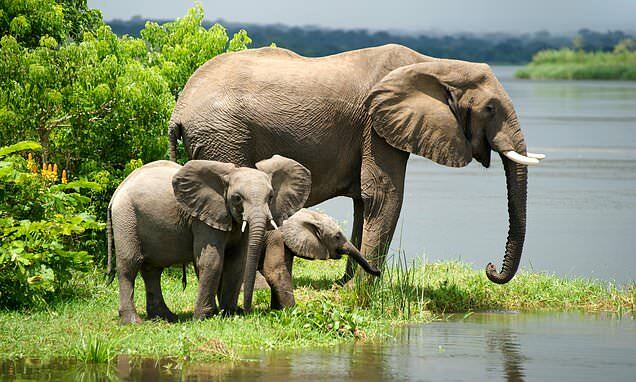 The area LC3 chairman, Mr Sam Ogwang Alunyu, on Monday said that more than 70 elephants were straying in the affected parishes in recent days. “From 6m, residents have to arm themselves with basins, jerrycans or saucepans which they keep on banging throughout the night in an attempt to scare the elephants,” he said. Mr Ogwang said that normal schooling had equally been affected by stray elephants, with the most affected being Nora, Apala B, Amati, Zambia and Akura primary schools. In the areas, pupils report to school at 9 am and leave at 3pm to go back home for fear that they would encounter with the wild animals which normally stray in the evenings to night time, he added. The LC3 chairman said unlike in the past where stray elephants ranged from three to four, but these days the number could be over 200. Each animal consumes between 100 –200 kilos of crops in the gardens and this has resulted into a serious famine. “We are suspecting that there could be some human activity in the park which is scaring the elephants to stray outside the park, because in the past the number of stray elephants used to be very few and were controllable,” he added. On Saturday, several stray elephants attempted to reach Oyam District headquarters but stopped a few kilometres. On Friday night, this newspaper understands that elephants crossed Tochi River and went as far as Obanga Ngeo which is less than 12 kilometres from the district headquarters.